B man has big ideas. He wants to build things and create things. He has awesome ideas. He doesn't always know how to carry out his awesome ideas. So he comes to me "Momma, can you help me build a cart?" Yikes! I don't know how to build anything. I mainly follow directions. Plus, I have a million and a half things to do so my answer is usually, "Yes, but first let me finish dinner." or "Yes, but let me send these few little emails." But first... Have you ever had this problem? Someone needs your help but first you've got to clear your plate? I feel like I can't give my full attention until my to do list is done. Early Christians had the same problem, sort of. The Jews had been under the law of Moses for a loooong time. The Jewish leaders were super good at the law. They took the rules God gave Moses and drilled down on them. They had a rule for everything. Every.Thing. As some Jews were coming to faith in Christ, they brought their rule following ways with them. 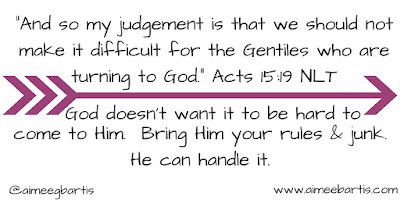 And they wanted the non-Jewish people, Gentiles, to follow their rules too. After all, Jesus was Jewish so why not continue to follow the Jewish rules? In Acts 15, Paul and Barnabas are in Antioch preaching the Good News of Jesus Christ. Some men arrive from Judea and began telling the new Gentile believers that they have to follow the law of Moses and be circumcised as required by the law. Paul and Barnabas, and some of the newly converted men I'm sure, vehemently disagreed with these men. The Bible doesn't say how long the conflict lasted but it does say that "Finally" the church decided to send a delegation to the Jerusalem to the apostles and elders to get an answer on the matter once and for all! The LORD tapped on my heart. Am I making my own faith in God too difficult? Am I setting up hurdles that must be jumped before I can fully commit to His will in my life. Yes, of course I am. I'm human. If I set up hurdles before I can play with B, why wouldn't I set up hurdles in my relationship with God? "I'll give when we have extra money." "I'll serve when things settle down." "I'll invite her to church when she seems to have it together a little more." "I would post that verse to social media, not everyone I know is a believer"
Sometimes I read about the law of Moses in the Old Testament and think "Man, how did they deal with all those rules?" Then I remember, I'm pretty good at rules. God doesn't want us to be separated from him by rules. He wants us to come to Him just as we are. We don't have to get everything right and lined up before we come to Him. He'll help us get all our junk in order. 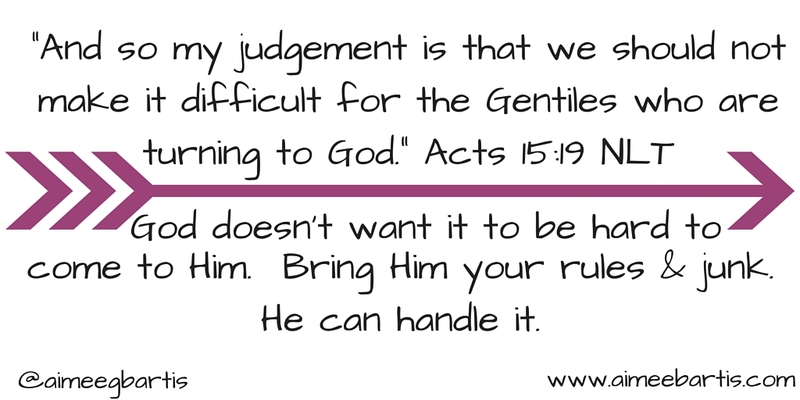 Just bring your rules and junk before the LORD. He can handle them. He loves us and wants us to be close to him.